The base package is the main part of the sponsorship contract. The base package is constructed in a way which can give our partners maximum exposure while providing them with maximum value for their money. The sponsorship contract will be signed for a minimum duration of 1 year. You can check latest prices at SponsorAdvertising page. Optionally, and free of extra charge, an immediate list of the greatest and most recent successes that the sponsored couples achieved. The list is generated automatically based on our database and is always up-to-date. Optionally, and also free of extra charge, a list of the sponsored couples' recent results. This list is also generated automatically based on our database and once again is always up-to-date. In addition to the standard banner, Sponsor can add an option of "swappable banners". In such case Sponsor can have any number of banners of all available shapes and we will select one of them to display. We will change displayed banner every two hours, so that visitors can see different adverts at different moments. According to the Sponsor's request, it is possible to limit the display to only certain parts of the site, e.g. to one language version. Three sponsored couples. See below for the detailed explanation. DancesportInfo continuously updates and develops its services, and we plan several years ahead with our services. We guarantee that whenever any new portions of sponsorship-ready services are introduced on our site that are incorporated in our sponsorship base package offering, all the existing sponsorship contracts will receive those services free of charge. An indication of the Sponsor on the gallery pages, with a small icon or text phrase by each of the couple's thumbnail pictures, as shown below. If you do not like particular photo you can exclude it from this feature. (The gallery pages make up around 20% of all DancesportInfo's traffic). Please note that due to the fact that our site is continuously improved, the real look may differ from presented. 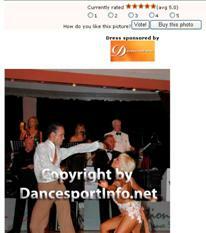 An indication of the Sponsor by the couple's full-size photos, with a small icon or text phrase, as shown below (The photos make up 10-15% of all DancesportInfo's traffic). Additionally you will get a Sponsor page, where your logo is displayed, your company described in your own words, and where all your sponsored couples are listed. This page also links directly to your own website. Some of the services we can offer thanks to our database are not needed by everyone - and for this reason, they are not included in the base package, but are offered as additions to the sponsorship package. You can upgrade your base package with any and all of these. Banner advertisements placed near the sponsored couples' photos. It is possible to sell the Sponsor's displayed dresses on the site. If the sponsored dress that is on any picture on our site is for sale, both the gallery thumbnails and the large pictures would have a "Buy this dress now" link next to them, and the dress can be bought from the sponsor on DancesportInfo. This maintenance can be done by the Sponsor on their customized, web-based maintenance page, or can be done by DancesportInfo. If the Sponsor is also a main sponsor of a competition, upon request from the Sponsor, the organizer (or the Sponsor) can publish their competition in our future competitions list, where only a select number of competitions are published. The sponsored competition can have all its details published on one special page that will automatically have the sponsor's banner displayed. The special page will be visible until the competition's date.